The Cleansed is a post-oil apocalyptic tale about Maria and Luke, sibling who escape with rebel leader John Prophet to to save the world from a second man-made apocalypse. The story is being produced by FinalRune Productions with sponsorship from WMPG, Community Radio in Southern Maine. WMPG, as a 501(c)(3) nonprofit organization, is handling incoming funds from the project which are being disbursed to FinalRune as part of a pre-defined production budget. FinalRune is principally responsible for raising the funds to complete the project. Frederick Greenhalgh (WRITER/DIRECTOR/PRODUCER) is the writer/director/producer of FinalRune Productions. Since 2006, he has produced 15 radio plays, including 10 original works. His efforts have been featured in The Wall Street Journal, The Guardian, and numerous local newspapers. 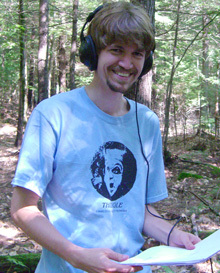 His 2008 play Waiting for a Window won the Gold Ogle Award for Horror/Fantasy Audio Drama; in 2010 the Pilot of The Cleansed won a Silver Mark Time Award.